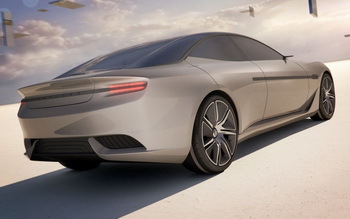 Images of Pininfarina's Geneva bound concept car, to be called "Cambiano", have leaked online ahead of its world debut, the shots presenting a sweeping grand tourer which incorporates several novel ideas, not least a coupé style finish on one side and a sedan look on the other. 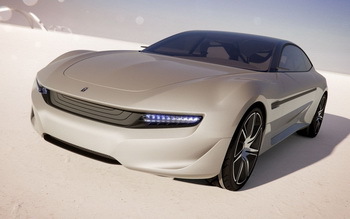 Images of Pininfarina’s Geneva-bound concept car, dubbed ‘Cambiano’, have leaked online ahead of its world debut. The shots reveal a sweeping grand tourer which incorporates several novel ideas, not least a coupé-style finish on one side and the look of a sedan on the other. Pininfarina usually pulls the stops out to try to create a distinctive showcar for the Geneva Motor Show, such as the pretty Alfa Romeo 2uettotanta two years ago. To this end, the Cambiano’s profile is attention-grabbing, although the overall design is somewhat generic, with hints of Aston Martin in the rear three-quarter view and some rather American-esque styling cues at the front and rear. Nevertheless, despite these conservative elements, the Cambiano shows off several interesting ideas. 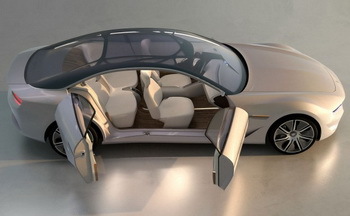 As well as the single coupé-style large door on one side and the two sedan doors on the other side (the rear door hinges from the C-pillar, an idea that Pininfarina says was drawn from the famous 1957 Lancia Florida II showcar), the glasshouse has been formed in one flush-flowing motion from bonnet to boot, and incorporates a single support section sweeping between the A- and C-pillars. The glasshouse area also reveals a minimal framework that provides the required rigidity. Inside, there are four seats upholstered in leather, and a varnished wooden floor. At the rear, slim LED lights use reflective properties. Under the hybrid car’s skin, Pininfarina says power comes from 80 hp electric motors on each wheel, while a small diesel engine will recharge the batteries. Range will be in excess of 200 kilometres. Acceleration from 0-100 km/h is claimed to take just 4.2 seconds, on to a top speed of 300 km/h, although it is unclear whether the car is any more than a show mockup. The new concept has been named after the Italian city of Cambiano, next to Turin, which is the long-standing home to the headquarters of the Pininfarina Group. It celebrates an important double anniversary this year: 30 years of the Pininfarina Styling Centre, whose operations got underway in Cambiano in 1982 (at the beginning it was known as the ‘Pininfarina Studi e Ricerche’, or Pininfarina Study and Research centre), and a decade of the Pininfarina Engineering Centre. The latter was inaugurated in 2002, with the aim of adding to the firm’s existing styling and development/niche production activities, with the wider offer of engineering services for other companies and carmakers.